Thank you for stopping by! 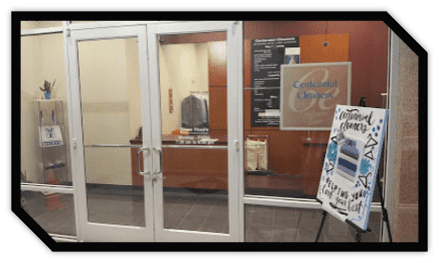 Centennial Cleaners is here to provide a convenient dry cleaning service for the business professionals located in Centennial Towers, in downtown Atlanta. We are a walking distance from offices around Centennial Olympic Park, CNN Center, Peachtree Plaza Hotel, State Bar of Georgia and Philips Arena. If your office is near of those buildings then we are the dry cleaners near you, here to serve your dry cleaning needs. If you are a business professional in downtown Atlanta who is pressed for time and is looking for a reliable dry cleaning service, then Centennial Cleaners is the place for you. We will provide a timely service to help keep you looking pressed and professional at all your business meetings. Centennial Cleaners is located in the heart of Atlanta, inside the Centennial Towers building lobby in suite 110, next to the Cone Street entrance. For your convenience there is a secure drop box for you to drop off your clothes at anytime. Just put your clothes in a bag that has your name and phone number on it and drop it into the secure drop box. When it comes time to find the right dry cleaner service for your needs, there are many options to choose from. But not all dry cleaning and dry cleaners are equal. Some dry cleaners use cheap chemicals that ruin the color of your clothing and sometimes leave it looking worse than when it was dropped off. As a working professional, the best choice is the team that respects clothing dropped off, as well offers the most convenient service possible. Centennial Cleaners is the local Atlanta, Georgia dry cleaning service that caters specifically to area working professionals. Located in the downtown area and surrounded by professional offices just like yours, we handle each item with the care it deserves. With convenient dry cleaning that won’t tarnish your clothes, we remain the best choice for your needs. Many working professionals simply wash and dry their clothing at home or in a laundry mat. Unfortunately, most professional dress clothing items aren’t designed to stand up to the harsh detergents and high heat of these machines, making them fade and wear out faster than they should. Not only can this leave your items bleached and stained, but it will cost more to replace clothing items more frequently. If you’re tired of your washing machine bleaching or putting holes in your expensive garments or you simply can’t find the right dry cleaners near, we are ready to give you the best dry cleaning service possible. By offering more laundry services in one centrally located convenient area, we can help you look your best faster than ever. For the best in local Atlanta dry cleaning and professional laundry services, more people know that Centennial Cleaners has everything you need. Stop by the Centennial Towers and see the difference for yourself. If it seems as if there is never a dry cleaner nearby, our Centennial Cleaners can save you time on your dry cleaning. When you choose the downtown dry cleaners, you’re choosing the laundry cleaners that offer more services in one close location. In fact, you may work directly above us; our dry cleaning services are located on the bottom floor of the Centennial Towers. By remaining close by to more office buildings and local professionals, we can assist more people with their dry cleaning services. ​When working full-time hours in a downtown office, it can be difficult to find the time to take care of your laundry. Rather than letting a pile of dirty laundry overtake your time and laundry room, let us help you with the best in local Atlanta wash and fold laundry service. We can take care of your laundry so that you don’t have to, freeing you up to take care of more things that matter most. ​More professionals are turning to shoe repair services rather than throwing out their favorite pair. Unfortunately, most shoe repair services are nowhere close to where area professionals work or live. But by remaining in the downtown district, shoe repair options are closer than ever, saving you time and money by averting a trip to the shoe store. Nothing looks more professional than a freshly polished pair of shoes. When you step into your office or meeting room, recently shined shoes are often the first thing that grabs people’s attention. When you have us shine your favorite pair of shoes, it helps make you look that much more professional. ​Did your favorite shirt get a hole in it? Are you missing a button or did your zipper on your favorite jacket come off? Do you need to have your pants hemmed or the waist brought in? In addition to offering the best in local convenient dry cleaning service, we also offer alteration services as well to help keep your clothing in good shape. Don’t give up on your favorite piece of clothing, but bring it by and see if we can repair it for you. If you have any questions about our full services dry cleaning & laundry services then do not hesitate to give us a call!